In 1960 I moved into a four-bedroomed New Town Commission house in Larchwood Road, Adeyfield, Hemel Hempstead. My family consisted of my husband, a Tax Officer in the Inland Revenue, my daughter aged 21 months and my son aged 2 months. My Mother was convinced that we were moving to the back of beyond because we were north of Watford. The rent was £2-10s. We had moved from a one bedroom flat in Mill Hill so the furniture was spread very thinly. The carrycot was put on upturned wooden apple boxes. A friend had given us a metal-framed hospital type bed and we had our bedroom suite. We bought a second hand sideboard, dining table and four chairs from Hartridges in the Marlowes. The back garden was just topsoil with bricks and builders rubble in it. At the front was a path made of ashes and a large space of mud, which would one day be a pleasant green. Every time we came into the house mud and ash would come in with us. In 1961 the landscaping was completed. This was a brand new estate on the edge of Adeyfield alongside Queensway. 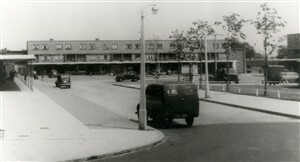 The nearest shops were at the Queens Square and nearly every day I walked with the pram with seat on top to the shops. I didn’t have a fridge so daily shopping was vital. Once a week I walked into the town to the Market. All my neighbours were strangers to the town and we quickly got to know each other. The men were mostly Civil Servants, Kodak and Dexion employees. There were a lot of children and most of the wives didn’t work outside the home. As usual the development had gone ahead of schools, shops, doctors and dentists. The junior school age children were bussed over to Chaulden and then to Highfield. We did not have a telephone, but we were on a waiting list. They were building a new exchange to replace the old Boxmoor exchange, which could not cope with demand. Once a week I would walk to the phone box to call Mum and Dad in Chiswick. In the first few months I found life very hard to cope with, then someone suggested that I had the ‘New Town Blues’. Gradually with the support of neighbours family and friends I felt better. I don’t know why I found it hard going but having a young baby and a toddler was a bit like being on a treadmill, one long meal all day and keeping up with the washing, ironing, housework and shopping was probably the cause. We were on the edge of the town then and it was just a short walk to the country lanes around St Agnells Lane or Three Cherry Trees Lane to see the pig farm and back down Wood Lane End. The Grove Hill Estate, Buncefield Oil Depot and Industrial Estate have covered these pleasant lanes and the town has now the largest population in Hertfordshire. In 1961 I worked at Kodak on the ‘Granny Shift’ – six until ten in the evening. I would get the childrens’ tea, my husbands dinner and when he came home I went off to work for another four hours. The evening shifts ran from spring to autumn. The extra money went towards new furniture, holidays and all the small treats children need. I worked these shifts for seven years until my husband changed his job. He became a Trade Union Official and had to attend evening meetings so evening work for me was not an option.